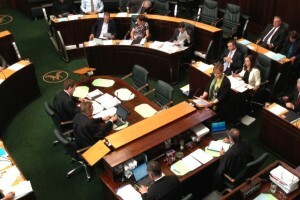 In yet another example of how Parliament’s vote on contentious issues may not necessarily reflect its constituents’ views, the Tasmanian House of Assembly has voted against the Voluntary Assisted Dying Bill by 13 votes to 11. This is despite a resounding four-fifths of Tasmanian constituents supporting voluntary euthanasia, the practice of terminating a life in a painless manner. Globally, Belgium, Luxembourg, Netherlands, Switzerland, and four out of fifty US states (Montana, Oregon, Vermont and Washington) have legalised voluntary euthanasia. The Northern Territory is to date the only Australian jurisdiction to have legalised euthanasia until the Federal Government reversed the decision. Within the House, seven out of ten Labor MPs and all five Greens MPs supported the controversial Bill, co-sponsored by then-Labor Premier Lara Giddings and then-Greens leader Nick McKim, but were faced with stiff opposition with all 10 Liberal MPs rejecting it. Following all parties’ grant of a conscience vote, heated and protracted debate over the Bill for 10 hours ensued. This initially culminated in a 12-12 vote deadlock. However the Bill was eventually defeated after Speaker at the time Michael Polley, who was able to cast a vote, voted against it. McKim co-incidentally introduced voluntary euthanasia legislation in 2009, which was rejected by a more convincing margin of 15 votes to 7. This may suggest that Parliament’s and society’s constantly evolving perceptions and values towards euthanasia. It is significant to note that the Bill was supplemented by stringent safeguards including the need for a patient to request for euthanasia a minimum of three times along with the need for consent from two general practitioners. Proponents of assisted suicide such as the Greens MPs would reassert the right of a terminally ill individual suffering excruciating pain to experience a dignified painless death, thus preserving their ordered liberty interest, provided they possess the mental capacity to do so. No-one should be subject to such suffering; their inevitable death should rather be hastened. Otherwise isn’t it ethically abominable to make someone live, who with vindication does not wish to do so? How is this any different to taking an individual’s life without their consent? Doesn’t the Bill’s safeguards afford it enough protection and ensure that a patient must be completely certain before ending their life? Should Governments be even able to intervene in such decisions? Arguments against the Bill varied from religious perspectives, with former Liberal leader Rene Hidding asserting that the Bill was anti-Christian, to legal notions in relation to the Bill’s supposedly flawed drafting. Its drafting was further criticised in the Tasmanian Law Society’s report, distorting the Bill’s credibility in protecting vulnerable patients. Opponents further claim that euthanasia ethically debilitates societal respect for the sanctity of life and may instigate a slippery slope that may potentially lead to involuntary euthanasia. Practically isn’t palliative care sufficient already? Legalisation of euthanasia may jeopardise the motivation to investigate for new treatments for the terminally ill and it may rather be masked as an economical practice. As societal views towards euthanasia evolve over time, provided their present overwhelming support for such reform, Tasmanians ought to not be too surprised if a similar Bill is reintroduced sometime in the not-too-distant future.